The mascot of the Games was "Roni", a raccoon. The mask-like rings on a raccoon's face recall the goggles and hats worn by many athletes in winter sports. The sports were played at the Olympic Center, Whiteface Mountain, Mt. Van Hoevenberg Olympic Bobsled Run, the Olympic Ski Jumps, the Cascade Cross Country Ski Center, and the Lake Placid High School Speed Skating Oval. The selection process for the 1980 Winter Olympics consisted of one bid, from Lake Placid, United States. It was selected at the 75th International Olympic Committee (IOC) Session in Vienna on October 13, 1974. The United States men's ice hockey team, composed mostly of collegiate players and not predicted to advance beyond group play, won the gold medal. 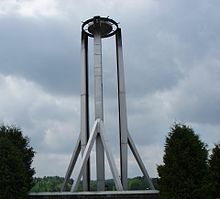 The United States team's 4–3 win over the veteran Soviet team, which came into the 1980 Games having won four consecutive Olympic gold medals, became known as the "Miracle on Ice" in US culture. The win captured the hearts of Americans, even though it was the win against Finland that secured the gold medal. Eric Heiden of the United States won gold in the 500m, 1000m, 1500m, 5000m, and 10,000m speed skating events, setting four Olympic records and one world record (10,000m) in the process and delivering 83% of the American gold medals (the only other gold, as noted above, was won by the hockey team). Heiden became the first person to win all five speed skating events, the first of only three to win five gold medals in individual events at a single Games (either Summer or Winter), and is still the only athlete to win five gold medals at one Winter Games. In possibly the most dramatic duel of the games, Sweden's Thomas Wassberg edged Finland's Juha Mieto in the 15 km cross-country skiing by 0.01 seconds, the closest margin of victory ever in Olympic cross-country skiing. Although they did not get any medals, the People's Republic of China entered the Olympic Games for the first time after the IOC agreed to designate the Republic of China "Chinese Taipei". 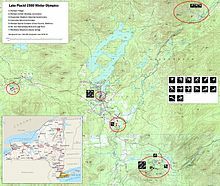 ^ "Lake Placid 1980 Torch Relay". International Olympic Committee. Retrieved October 31, 2016. 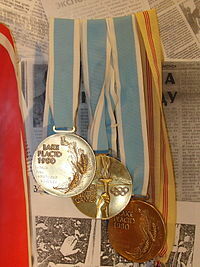 "Results and Medalists — 1980 Winter Olympics". Olympic.org. International Olympic Committee.